Today’s Lumippalay takes a look at a fun word search game called “Wordament”, (currently being recommended on Nokias ‘App Highlight’ for the Lumias). Wordament is an interactive Multiplayer game that revolves around a very simple basis of connecting blocks/tiles to form as many words as possible, you simply swipe between any adjacent tiles to form a word (minimum is 3 letters per Word), the more tiles/letters you use in your word as well as how rare the letters are (similar to scrabble scoring of tiles) will increase your score. Each round is two minutes long (or short) with a 40 second rest stop between rounds; once the round ends all the words you found as well as all the possible word formations are displayed on the screen (separated into Common & Obscure). You also are given a large amount of stats such as the total amount of words possible (usually around 200 hundred per puzzle!! ), the total number of points possible to accumulate, how many seconds per word, the average number of letters per word found, the average points received per word. Halfway through the inter-round break the game leader-boards appear, showing you the scores of everyone participating in the match, where they’re from, as well as how you matched up against them. Wordament® is a unique kind of word game—a word tournament—where you are competing with the whole internet to be the best word searcher in every game. Every player is competing on the same board, in real-time, to get the highest score. Will you be the Wordament champion? 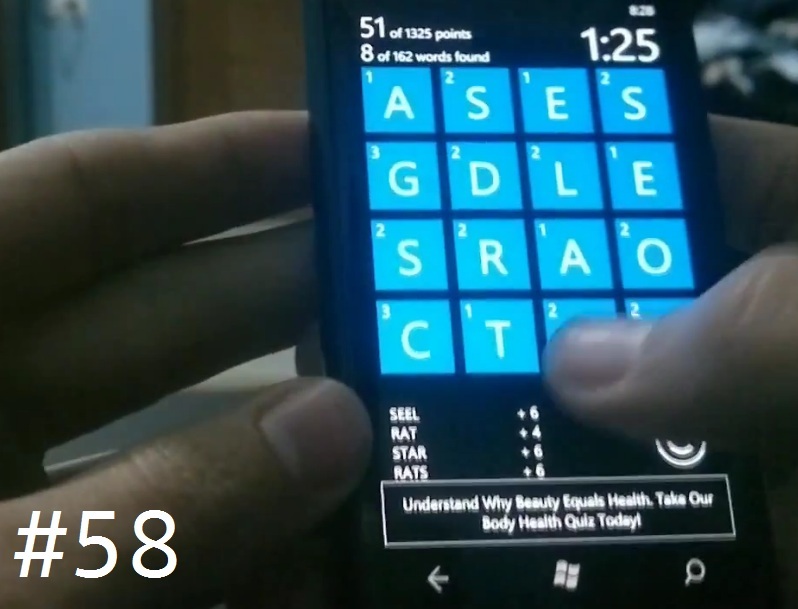 Wordament is a thriving game on Windows Phone 7 with an active community of players spanning the globe. This latest release brings with it more real-time player stats, drastically improved performance on all handsets and a new user interface available in English, Spanish, French and Italian. Game boards remain in English. The new real-time stats let players see how many average seconds it takes to find words and how many average points they are finding per word. As always, every round ranks players vs. the Internet, but now we also track the player’s percentage rank: this is a normalized score from zero to one hundred that makes it simple to see how you fair round over round, no matter how many players are online or the complexity of the boards. Keep your friends close, but your enemies closer! Tap names in the results list to add them to your personal list of Frenemies™, which is shown at the end of every game. Wordament features unique, highly playable games. Every board is guaranteed to have over 100 possible words, and every tile is playable. Our dictionary is tuned to help you find the most common words you missed. We also have themed games, like Digraphs, where we introduce a simple, but fun secondary goal of using a two-letter tile in as many words as possible. Last, but not least, Wordament has a rich collection of stats and leaderboards for you to see how you are improving over time as well as how you rank against the internet and your friends. How you play and how you win is up to you!